Arabic Bible "Calligraphy": Expression Of Art Or Evidence For Deception? It is with this “mission” in mind that they have started to infiltrate countries where the majority of Muslims do not habitually read or speak Arabic. 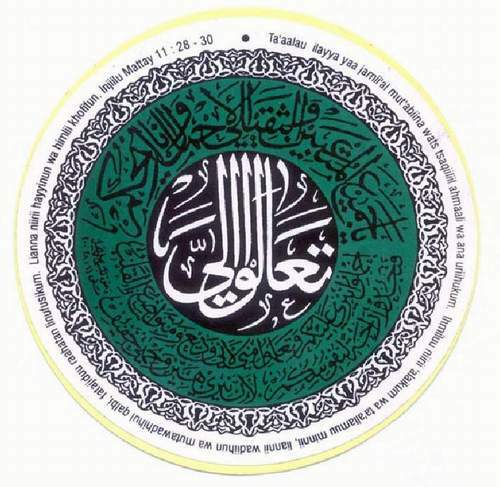 The missionaries have begun selling images which mirrors the calligraphy often found in Qur’anic verses, but instead of the usual Qur’anic verses, they cite verses from the Arabic Bible instead. This truly displays the deception of the missionaries in order to dupe gullible Muslims to their cause. We reproduce below two examples of such images which deploys calligraphy for the Arabic Bible. Please especially note the calligraphy used in the following images. Below is a citation from the Arabic Bible verse of Matthew 5: 44-45. Below is another citation from the Arabic Bible verse of Matthew 11: 28-30. It is clear that the missionaries are selling these kind of images for the sole purpose of duping Muslims from non-Arabic speaking background. These Biblical images have also clearly been purposely portrayed with the style of calligraphy to mirror that of the usual Qur’anic calligraphy familiar to these Muslims who will hence find it difficult to distinguish the two. For those who object in saying that calligraphy is not exclusively an Islamic art, perhaps one should wonder whether they will accept it if Muslims were to translate the Qur’an into Greek, bound them into books which mimics the Bible, and start distributing copies of it to Christian homes! One only wonders whether such dubious methods are “inspired” from the Holy Spirit, the third member of the Trinity, or from the unholy Devil himself! These are done by Arabs who are Christians who are combining aspects of their heritage. They are not intended to deceive. So by your logic it is decietful when Muslims print anything in English, using Western looking fonts?? These Biblical images have also clearly been purposely portrayed with the style of calligraphy to mirror that of the usual Qur’anic calligraphy familiar to these Muslims who will hence find it difficult to distinguish the two. Are you saying that some non-Arabic speaking Muslims are so ignorant they can’t tell the difference between passages from the Christian New Testament from passages of the Al-Quran? What sort of half-baked Muslim is that & what did they learn/not learn from their Ulama? It becomes deception when such deceptive ‘calligraphy’ is routinely distributed among Muslims as is done in Pakistan!!! Duping them into … what exactly? It is not as though these pieces make claim anywhere on them to being from the Qur’an, or fail to note that they are from the Bible. Your suspicion appears to be overtaking your sense. Arabic calligraphy is arabic art of writing. It is not quranic art. 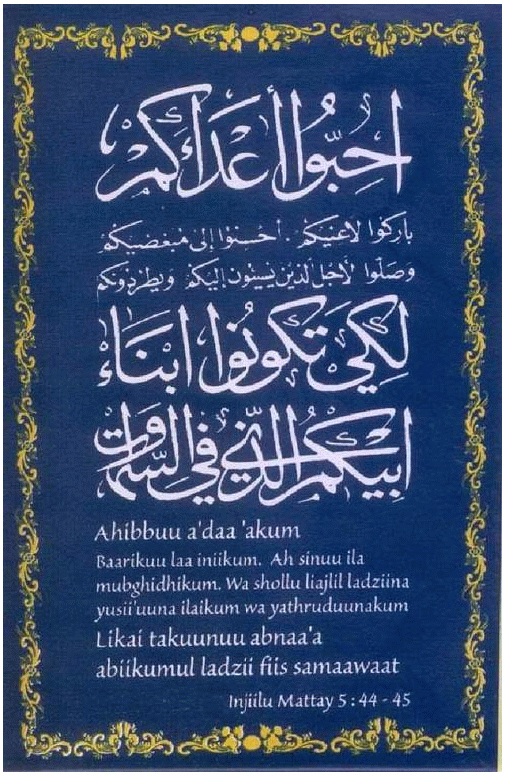 However the art is used to write quranic verses, and also used to write arabic bible verses. What is the problem with that?. The arabic language is for the arabs wether they are muslims, christians, jews or else.